SunTrust Building at 12-14 W. Beverley Street. Built in 1903. The answer to last month’s quiz is Beaux Arts. Characteristics include rich, heavy ornaments with slightly over scale details (especially over windows), arched and round windows, and symmetry with classical details. “The Castle”. Designed by T.J.Collins & Son for Arista Hoge. 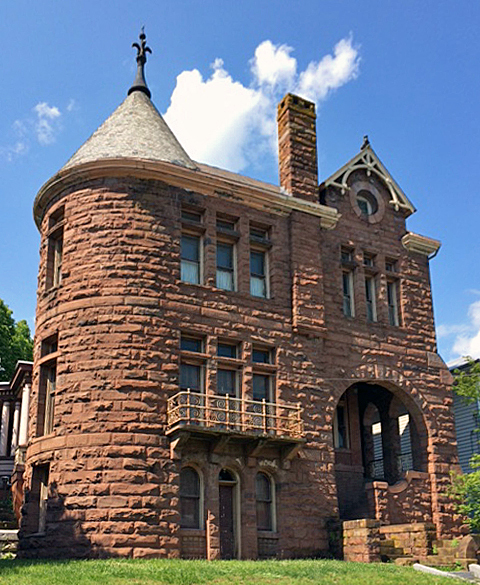 Richardsonian Romanesque, named for Henry Hobson Richardson (1838-1886). 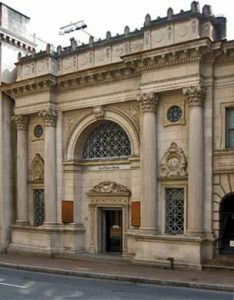 Characteristics include a strong fortress-like masonry appearance with recessed entrances, over-sized carvings, round arches, short squatty columns, and a structurally solid look. This style was favored for county, state, and federal buildings (especially out west), and was well loved by Victorian robber barons of Brooklyn (NY).